Threads can communicate using WaitHandlers by signaling. Mutex, Semapore and EventWaitHandle are derived from WaitHandle class. There are two types of EventWaitHandlers. AutoResetEvent and ManualResetEvent. AutoResetEvent lets one waiting thread at a time when Set() is called but ManualResetEvent lets all waiting threads to pass by when Set() is called. ManualResetEvent starts blocking when Reset() is called. This acts like a turnstile which lets one at a time. When a thread hits WaitOne(), it waits till some other thread calls Set(). Take a look at the following picture. 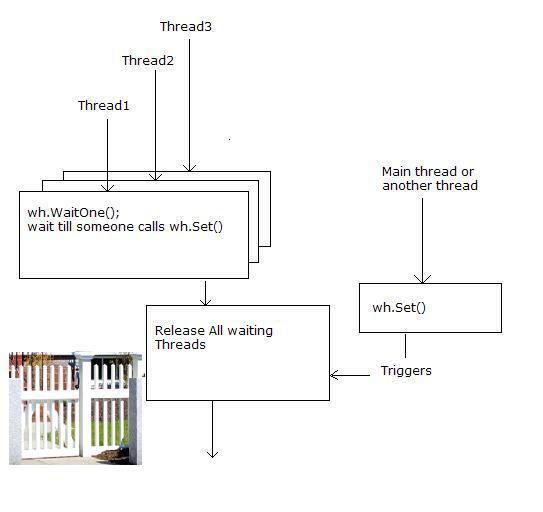 Thread1, Thread2 and Thread3 are waiting after calling WaitOne(). For every Set() call from another thread, one thread will pass the turnstile. I have created a simple application to test this. There are two buttons to span a thread DoWork. DoWork has WaitOne call and it blocks threads. Third button calls Set() to release one thread at a time. Click first two buttons to span thread and click third button twice to release blocked threads. 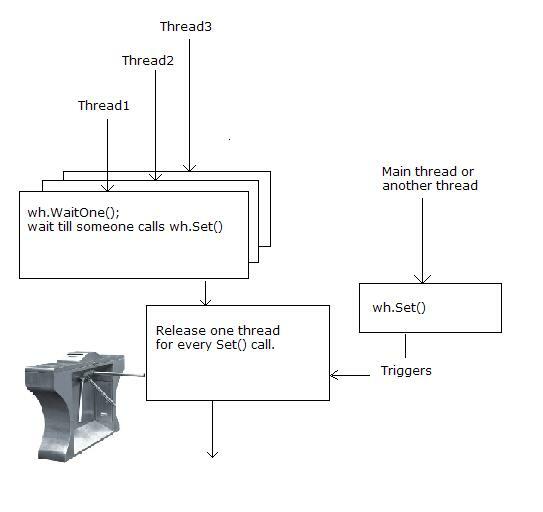 Please note that the code after WaitOne call in DoWork is not thread safe. A call to Set will let next waiting thread to enter even the first thread is still executing the code. This is like a gate which lets more than one at a time. When a thread hits WaitOne(), it waits till someother thread calls Set(). Take a look at the following picture. Thread1, Thread2 and Thread3 are waiting after calling WaitOne(). When Set is called from another thread, all waiting thereads will pass the gate. Code snippet to illustrate the above.